and so on. 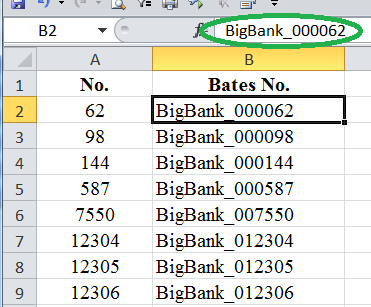 The tricky part of this is adding the “BigBank_” prefix while also getting the right number of padding zeroes into each number. You certainly don’t want to type them out one at a time–right? 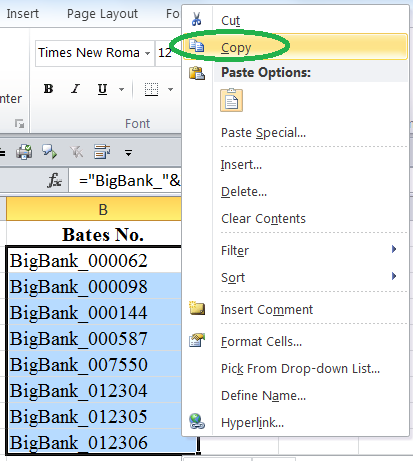 Excel’s TEXT function makes this easy. 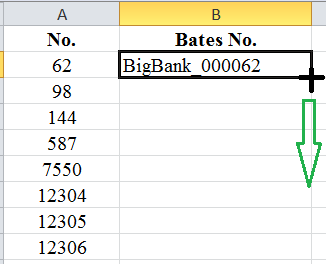 Here’s how the formula works: “BigBank_” is the prefix for each Bates number, and the TEXT formula with the “000000” argument tells Excel to convert the number in Column A to text and add the appropriate number of padding zeroes to get a total of 6 digits. The ampersand (&) combines both pieces into a single string of text. The cells will appear the same, but now the content of each cell is the resulting Bates number, rather than that funny formula–as reflected in the formula bar. 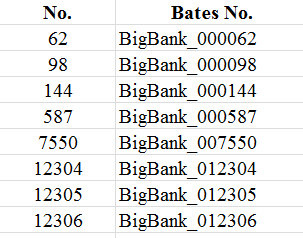 Now these Bates numbers can be pasted into Relativity or other document review platform. Of course, this trick will work if you have 8 numbers or 800. Thanks for reading. If you have a thorny Excel issue, please share it in the comments below. To learn about hosting a CLE-approved Excel workshop at your law firm, company, public interest organization, or bar association, click here or email Ben Kusmin from Excel Esquire. 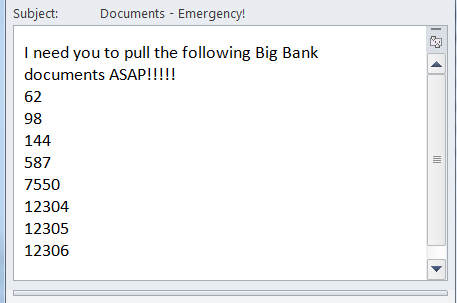 This entry was posted in CLE, eDiscovery, formulas, Lit Support and tagged CLE, eDiscovery, everyone, Excel Formulas. Bookmark the permalink.